of two 350mm diamond blades spaced 20mm apart, which enable it to be used for cutting channels and expansion joints. Masonry saw ideal for the building sector suitable for straight and 45° angle cuts of bricks, stones, concrete-blocks, granite, marble and natural stones. This piece of equipment features a single phase motor, overheat protection, laser instrument, sliding work table, goniometer and water tank for faster cutting and longer blade life. 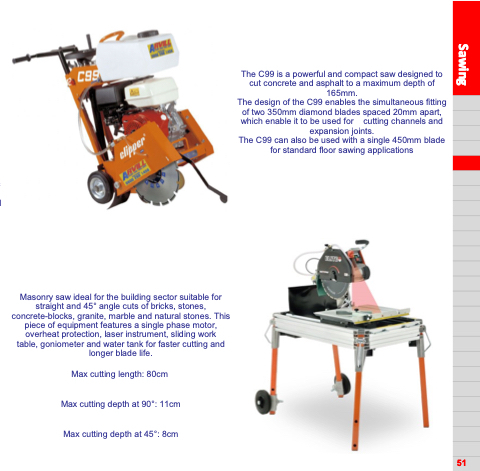 The C99 is a powerful and compact saw designed to cut concrete and asphalt to a maximum depth of 165mm.